BORN, Honorius van den (= Erycius PUTEANUS). Sedigh leven, daghelycks broodt'. Met korte jaer-langhe dicht-stichtighe spreuck-beelden, tot deughden voedsel uytghedeylt. Leuven, Everaert de Witte, 1639. Oblong 8vo (8 x 13.5 cm). 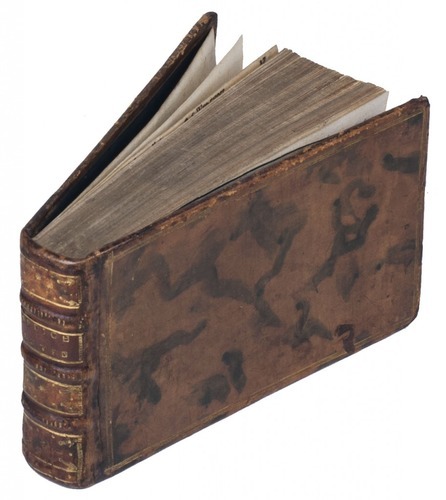 Contemporary mottled calf, gold-tooled spine. 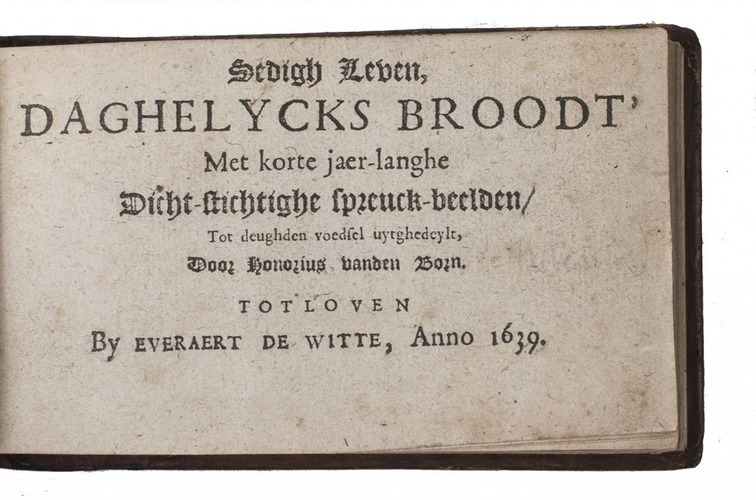 A delightful little volume containing 366 moralistic Dutch epigrams, one for each day of the year. This is the second and much enlarged edition; the first was published the previous year and contained only 255 epigrams. Erycius Puteanus (Eerijk de Put) taught Latin and rhetoric for 40 years at the University of Leuven. He published over 100 works, almost exclusively in Latin. 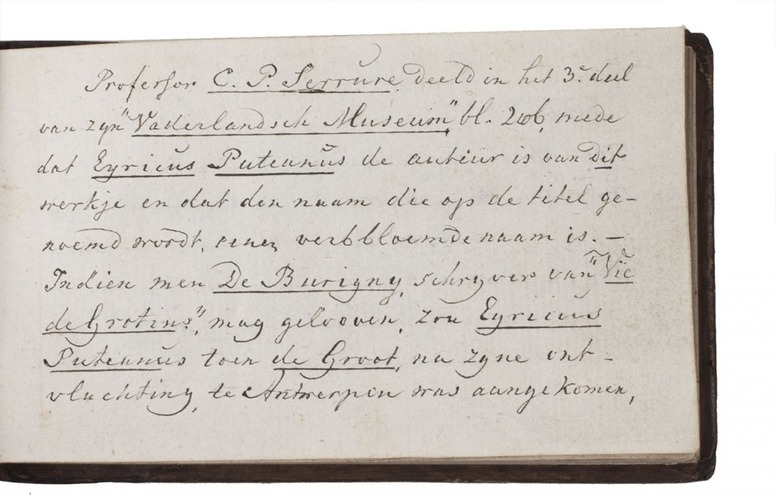 With the publication of these verses in his mother tongue, the author wanted to promote the Dutch language. The verses show the influence of stoic philosophy and are devoted to a wide variety of themes, ranging from the education of children to descriptions of professions. Some repairs; a few leaves shaved. Good copy of this rare edition with some 19th-century annotations on the first two fly-leaves and the bookplates of 'JLC' (?) and Isaac Meulman. Bibl. Belgica IV, p. 809; Bibl. cath. Neerl. impr. 9254; STCN (4 copies, of which 3 incomplete); cf. Dehennin (ed. ), Puteanus (Henricus van den Born), Sedigh leven, daghelycks broodt (Ghent 1999).